Made with turkey kielbasa, this entrée also includes chia seeds, which have an extraordinary range of health benefits. Containing 6 times more calcium than milk, 6 times more iron than spinach, and a plethora of other vital healthy benefits, chia seeds are a great addition to almost any meal, drink, and even dessert! Spray a large skillet with a generous amount of Pam cooking spray with olive oil over medium-high heat. Add kielbasa slices when skillet is good and hot. Let the kielbasa brown on one side (about 3 to 4 minutes) and turn over. Add onions and garlic and let brown on the other side. Reduce heat and add beer, kale, and chia seeds. You may need to spray more cooking spray on kale. 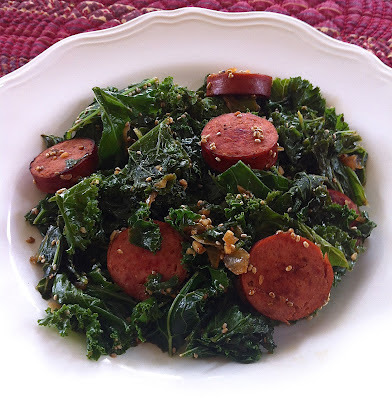 Cover and let cook 6 to 8 minutes or until kale is tender, stirring several times. Turn off heat and season with salt and pepper, to taste. Enjoy! If you'd like a printer-friendly version of this recipe, Click Here. "Positive thinking is not about expecting the best to happen every time, but accepting whatever happens is the best for this moment."